Rangers are once again rattling sabres over the matter of their moving to England. Now they have jurists and pseudo-jurists (how is Giovanni’s court case going, by the way) claiming that the English FA, Premier League and Football League are guilty of discrimination under European law by restricting trade due to nationality and that the European courts will find in their favour, forcing English football to accept the club into their midst. Quite how they work this out is anyone’s guess, though I may, myself, head off to Strasbourg, just down the road from where I am presently living, and claim that the refusal of the Paris Bourse to accept my one-man boat-repair company onto the CAC 40 listing is limiting my ability to trade. So Rangers head off to the courts, represented by shareholder and defender (by his own admission) of half the war criminals and mass murderers of the last 30 years, Giovanni Di Stefano who puts forward the argument that being limited to playing in a tiny, Vatican-controlled backwater inhabited by alcoholic, unemployed layabouts and which is intent on flushing itself down the pan by building the New Panama Canal along the border with its cash-rich southern neighbour, is indeed a restriction on their ability to rake in billions of pounds. The question of why it didn’t just buy one of the existing clubs facing bankruptcy will, of course, never be brought up. Fast forward a couple of years. By the time Scottish independence becomes a reality (in 2016 if things go to plan), Rangers’ case may have worked its way through the slowly turning machinery of European justice and we may find that, just as Scotland becomes a nation once again, its biggest football club is making its way down the M74 to become Perfidious Albion FC, though few in the newly freed land, with its empty oil wells and foreign-owned distilleries, will shed a tear for it or its psychotic supporters. It is announced in the Scottish Sun, the only daily paper left in the country due to a mass boycott of the others, that well known bloggers have committed suicide, having no further purpose in life, and BBC Scotland’s sport department is to be shut down as there is nothing left to talk about. 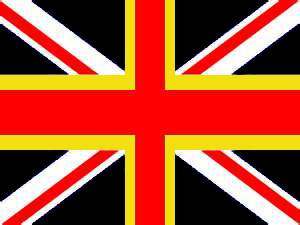 And so, finally, to the Union Flag which the faithful will be waving as they sing “God Save The Queen.” With Scotland no longer part of the union, the Cross of St Andrew will be removed from the flag, to be replaced by the Cross of St David. This will result in the design shown below. The new colour scheme seems totally appropriate as it reflects the Germanic origins of the present Royal Family. So, future fact or totally fantasy? The first indications will be given in 18 months time. The biggest culture shock for the cross-border hordes will be the twice-weekly hostilities of being branded ‘Jacobite hordes’ (pace on misguided reporter in Manchester 2008) and ‘Scottish scum.’ Rangers will need to re-think their whole Union identity and will indeed become the new ‘Pretenders’ to the Premiership crown – if they don’t take fright at Derby upon consideration of the army of awating Chelsea Pensioners and the capital with it’s mighty Arsenal and Gunners to repel them. Or the Sasuinn may just repeat history and come north to send the hordes fleeing into exile and humiliation – robbing the Ibrox spoils en route. You have to be joking mate. It looks as though the nazis won the war? You will find her Britannic majesty was born in the United kingdom , so is therefore British , are you trying to be a smart erse by inferring her distant relatives were of German origin that she is not British ? If so are you saying that people born here are not British because of their ancestry ? And what is it of your concern ? You live just down the road from Strasburg , phoopy doo! Let us who are proud of our country , our Queen and our flag worry about it , I for one find it a great source of comfort to know I live in this great land of ours and live under the union flag and support a team that embraces all things British …… now let the haters take aim and ….. Fire !!! ……. I’m off for a pint . carson – ‘mein kampf’ lol. not so proud as to ‘pilfer’ millions from elizabeths realm c. money that could have been used to buy the latest equipment, kitchen included, for her serving battalions and prevent the latest round of services cuts. congratulations on your guilty clubs contribution to weakening the defences of all who ” live under the union flag”. Once you pay your debts, then come back and lecture us about the Saxe-Coburgs. Meanwhile I hope that your pint’s paraquat or similar. ah Carson, where oh where do I start… nah, I’ll not bother, too much detail and facts will only wash over you. nuff said that the ‘nation’ you are so proud of gave us the ‘butchers apron’, currently in the international courts re torture in kenya, and historians debating if your great nation was actually guilty of genocide in India… Ireland and everywhere else they have pillaged we’ll leave for now. yes indeed the great House of Windsor’ only became so on the cusp of war with Germany, your much loved (derided) royal family a cosmo bunch of in breads not actually ‘Brit’! Now, of course Carson I know that any post counter to your delusions can leave no mark upon you, make not a jot of difference – because you and your lickspittle friends share no interest in historical truth, to do so would indeed, bring your house of grand delusion crashing down – and where would that leave you and your like? Anyhow Carson (hey clever pseudonym eh!!!) you carry on and surround yourself with the bampottery that makes you feel good, you should take great solace in the shared history of your football club (now dead) and the UK… no more butchers apron, simply Americas lapdog, no more “no surrender” simply 4th tier part time football. a nation and a football club each as tawdry as the other, each as shamed. Breaking News! The Queen has got Diarrhea!!!! You must be beside yourself. Please rest assured that we are all thinking of you at this difficult time. um carson, see the thing is…the Queen does have Germanic origins, but the post does in no way imply she is not British. I mean – just to take a loosely related example – an Irish family arriving in Scotland at the same time as Liz’s forebears’ they would be as British as Liz wouldn’t they? There is speculation that in the event of Scottish independence Scotland and England/Wales would be new entities and would need to apply for membership of the EU. Chances are neither would get in and nobody would take any notice of the European Courts. One of them would keep Britain’s place inside th community and I’m sure the other countries would prefer a pro-European Scotland to the I’m-English-an-that’s-all that-matters-to-me attitude of those south of the border. There is a military fantasist type guy on Rangers websites and Vanguard Bears who goes by the pseudonym of D’Artagnan (I know….I know).This Walter Mitty type guy also calls himself the ‘Wild Un’ from his imaginary military career.He is the stereotypical blogger on Darkside websites and seems to love the Union fleg.The SNP would be very clever if they used this fanny’s fantasy posts to show the warped mindset of the fleg wavers who oppose independence. If you ever want a laugh out loud then read this clown’s self important semi literate ramblings. If you ever want informed opinion then read Paul’s self effacing and extremely witty posts on this blog. Keep on Keeping on Sir……you bring clarity in all this confusion. There was a time when said D’artagnan was a frequent and, dare I say erudite poster on one or two Celtic messageboards. His deterioration into madness coincided with the return of Sir Cardigan of Carmyle to familiar shores. And of course the last throw of the financial dice by Lord Minty of the Moonbeams. More to pitied than scorned, I say. I see that Mr McCoist has an interview in the Scotland on Sunday where he indicates that he feels Rangers should be promoted into the 2nd tier (and effectively above teams in the tier above them at present). 1. Does that mean that the journey back through Scottish football’s lower leagues no longer holds the same appeal to Rangers, having had almost one season of it already ? 2. Is the intention to leave for other shores now on the back burner and the desire is to get back into the SPL instead (on the basis that, when it comes to the crunch, Mr Green, if he is still there at that point, will put financial considerations above his ill advised remarks about Rangers never playing in the SPL again) ? Delighted to see Mr McCoist speak out to some extent against the sectarian chanting/singing by the Rangers support. Do think he could be a bit stronger about it but at least a start. Surprised that he never spoke out against this in the past when he was a player with a high media profile; would be fascinated to know if he had ever sung such songs himself (perhaps as a young supporter or in celebration after a cup or league title win) and whether this made him feel awkward about discussing the issue. Will never know, of course..
To me, the sectarian blight on Scottish football as a result of the dreadful songs sung by various team’s supporters are a greater issue than any of the financial shenigans by Mr Murray etc. It has gone on for longer and will take longer, unfortunately, to root out and deal with I fear. Good to see you have cheered up a bit now mick. A wee mass huddle wi yer pals and everythings ok with the world again. Prosperity to Scotland and no Union. As we all know Edinburgh is a much more cosmopolitan city than Glasgow, and we did a wee survey today as we slogged up the hill. Well we asked a few wordly wise folk and they had never heard of us. They have heard of the famous Glasgow Rangers and their smaller rival,but thats it,don’t know,don’t care. The Hibees and the Jambo’s dinnae like us weegie fuds. All the folk we met today have different obsessions mick,many interests and passions. I hope the guys in the work hut don’t give you it tight this week.It brings out the worst in you, and its not pretty. Perhaps you had too much vinegar instead of the sauce with chips. I was born in Scotland but some peepul keep tellin me tae go hame to Ireland ??? ….I’m i British ?? ……….don’t really care ! Fuc% Charles Green,Fuc£ Ally McCoist,F#ck England & definitely Fuc@ their union Jack! Fuc£ the Sfa,Fuxk the Spl & Fuc% Lord Nimmo Smith,Fuc# Campbell Ogilvie & David Murray….GOD BLESS CRAIG WHYTE!!! That was a pointless and offensive post. Always has been and always will be a flag of oppression, them colours never change, aboot time Doncaster and regan waved the white flag and admitted defeat, an embarrassment to any association and complicit in the biggest corrupt scandal in British history. Hail hail, NO TO INDEPENDENCE. Its always amazing the amount of people who want to wrap themselves in the Union Flag for fear of having to educate themselves or get a personality. They hide behind it like cowardly sycophants behind the belligerent bully in the full knowledge that all the forces of the corrupt state are ranged in their favour. They couldn’t have an independent thought if their life depended on it. Rangers, like British Imperialism are dead and what we are witnessing is the death rattle of the dying corpse manifest in the shape of the Union flag and Sevco 5088. The zombies from these corpses are still trying to pretend that things are still the same as they were a hundred years ago…poor lost souls. Oh, and Carson . . .we know you are reading this and not away for a pint cos you are one of those anachronistic zombies who are obsessed with the success of Celtic.